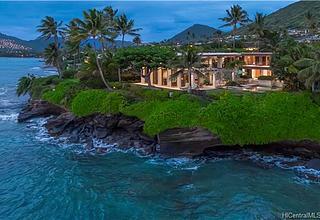 From the legendary Creator and TV Producer of “Entertainment Tonight” and “Lifestyles of the Rich and Famous” comes Kekaulani - one of Hawaii’s most exclusive luxury residences offering magnificent sweeping ocean and mountain views! Designed and built by Al & Charlyn Masini together with Architect Richard R. Bass, AIA, this two-story hillside home is grand in both vision and scale, and offers unmatched quality in every detail. Architectural excellence is complemented with elegant finishes of the highest standards, exquisitely framing walls of glass capturing breathtaking ocean views looking East and South. Approximately 270-degree dynamic blue ocean and green mountain views, ever-changing with passing clouds and enchanting rainbows. The neighboring islands of Molokai, Maui and Lanai are visible on most days, as well as the Big Island on other days! Private 5-Star Resort atmosphere with koi pond stream and tropical waterfalls, outdoor spa Jacuzzi, elevator with biometric access, home theaters, personal gym and 4-car garage. 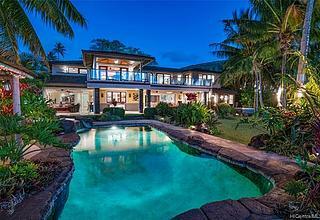 This spectacular dream home offers security in Honolulu’s prestigious gated community, Hawaii Loa Ridge. READY TO MOVE IN! Make Kekaulani YOUR “Place in the Heavens”! Featured in recent Honolulu Star-Advertiser article "Haven in the Heights"
* Designed together with Architect Richard Bass, the home's architectural excellence is evident in every detail with curved walls of glass capturing stunning ocean and mountain views looking East and South. * A serene tropical atmosphere welcomes you as you enter the secure front gate. Beautifully manicured landscaping surrounds a private courtyard, tea pavilion, and delightful water features including 2 waterfalls and 3 weirs flowing into a lovely Koi pond. * Custom ornate medallion of jewelry grade lapis lazuli and onyx greets visitors in the 17ft high domed marble foyer featuring curved walls of windows and glass doors. * Approximately 270 degree dynamic blue ocean and green mountain views, ever-changing with clouds and tropical rainbows. The finest of fabrics are used for motorized drapes throughout the house and Air Conditioning comfort is controlled with 15 zones. * Incredible entertainment areas, featuring an indoor/outdoor audio system, include an outdoor courtyard terrace with custom Hula Dancer bronze sculpture. * The Grand Room surrounds the dining area platform for entertaining friends and family while enjoying spectacular ocean and mountain views. 10ft ceilings in main living areas. Custom lighting and chandeliers highlight exquisite custom design details. * Audio/Video area with plasma TV, iPad-controlled projector screen and drop-down 100" movie screen plus exceptional surround sound system. Blue Bahia and Grecian Thassos marble entertainment bar with seating for 8 overlooks the hand selected blue Lapis Lazuli fireplace. * Baccarat crystal lighting and European crystal sink in the formal guest Powder Room with sit-down make-up area. * Stylish kitchen features starburst chandelier, blue pearl granite counters, Professional Gas Range w/custom polished stainless steel range hood, Double ovens, warming drawers, undercounter refrigerator/freezer drawers, double Bosch dishwashers, wine refrigerator, Sub-Zero refrigerators, 4-seat breakfast bar with pop up tv. * Luxurious East-facing Master Suite with curved walls of glass framing grand ocean and breathtaking views of the verdant Ko’olau mountains and valleys. Custom draperies, black out shades, plus automatic drop down projector and movie screen. * Opulent Master Bath with onyx floor and counter details, exudes luxury & style and is functional in design and lighting. Large walk-in shower, jacuzzi tub, His and Her bathrooms, all illuminated by beautiful chandeliers and recessed lighting. * Guests will appreciate the distinguished ambiance in the sunny and bright Guest Suite overlooking tropical waterfalls, koi pond, and meandering stream. All bedrooms include large walk-in closets. * Marble, Italian glass tiles and custom stained glass details in the Guest Bath with tub and large walk-in shower. * Impressive ocean view exercise space includes 24 pieces of equipment plus free weights for a healthy lifestyle. Features a full bath and overlooks amazing courtyard terrace, ocean and mountain views. This area could also be a large bedroom or two bedrooms. * Resort-like setting includes heated outdoor spa with tropical waterfall, outdoor sound system hidden in faux rocks, and tiki torches for romantic Hawaiian nights. 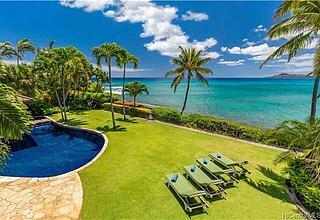 A private oasis with amazing ocean and mountain vistas! * Biometric Entry elevator offers convenience and security on all 3 levels. * Air conditioned 4-car garage with finished ceramic tile floors, mirrored walls, blue pearl granite counters plus sink & refrigerator provides a great staging area for backyard parties. Storage and workshop plus adjacent half-bath for staff. * Security in the home includes coded gate entry with intercom system plus exterior & interior cameras. 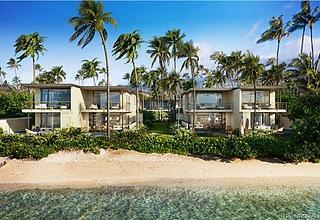 The prestigious gated community of Hawaii Loa Ridge offers additional security with entry guard and security patrol. I found this listing at 828 Moaniala Street in Honolulu and would like more information. Thank you.